161:0.2 When the hour came to leave for Jerusalem, Nathaniel and Thomas were still in the midst of their discussions with Rodan of Alexandria, and they secured the Master’s permission to remain at Magadan for a few days. And so, while Jesus and the ten were on their way to Jerusalem, Nathaniel and Thomas were engaged in earnest debate with Rodan. The week prior, in which Rodan had expounded his philosophy, Thomas and Nathaniel had alternated in presenting the gospel of the kingdom to the Greek philosopher. Rodan discovered that he had been well instructed in Jesus’ teachings by one of the former apostles of John the Baptist who had been his teacher at Alexandria. 161:1.4 Thomas contended that God does communicate with man, and therefore that the Father is a person, even within the definition of Rodan. This the Greek rejected on the ground that God does not reveal himself personally; that he is still a mystery. 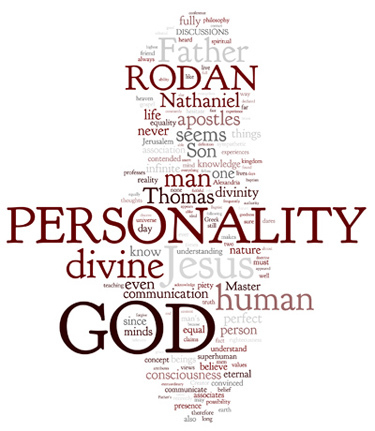 Then Nathaniel appealed to his own personal experience with God, and that Rodan allowed, affirming that he had recently had similar experiences, but these experiences, he contended, proved only the reality of God, not his personality. 161:2.2 1. Jesus has admitted his divinity, and we believe him. Many remarkable things have happened in connection with his ministry which we can understand only by believing that he is the Son of God as well as the Son of Man. 161:2.3 2. His life association with us exemplifies the ideal of human friendship; only a divine being could possibly be such a human friend. He is the most truly unselfish person we have ever known. He is the friend even of sinners; he dares to love his enemies. He is very loyal to us. While he does not hesitate to reprove us, it is plain to all that he truly loves us. The better you know him, the more you will love him. You will be charmed by his unswerving devotion. Through all these years of our failure to comprehend his mission, he has been a faithful friend. While he makes no use of flattery, he does treat us all with equal kindness; he is invariably tender and compassionate. He has shared his life and everything else with us. We are a happy community; we share all things in common. We do not believe that a mere human could live such a blameless life under such trying circumstances. 161:2.4 3. We think Jesus is divine because he never does wrong; he makes no mistakes. His wisdom is extraordinary; his piety superb. He lives day by day in perfect accord with the Father’s will. He never repents of misdeeds because he transgresses none of the Father’s laws. He prays for us and with us, but he never asks us to pray for him. We believe that he is consistently sinless. We do not think that one who is only human ever professed to live such a life. He claims to live a perfect life, and we acknowledge that he does. Our piety springs from repentance, but his piety springs from righteousness. He even professes to forgive sins and does heal diseases. No mere man would sanely profess to forgive sin; that is a divine prerogative. And he has seemed to be thus perfect in his righteousness from the times of our first contact with him. We grow in grace and in the knowledge of the truth, but our Master exhibits maturity of righteousness to start with. All men, good and evil, recognize these elements of goodness in Jesus. And yet never is his piety obtrusive or ostentatious. He is both meek and fearless. He seems to approve of our belief in his divinity. He is either what he professes to be, or else he is the greatest hypocrite and fraud the world has ever known. We are persuaded that he is just what he claims to be. 161:2.5 4. The uniqueness of his character and the perfection of his emotional control convince us that he is a combination of humanity and divinity. He unfailingly responds to the spectacle of human need; suffering never fails to appeal to him. His compassion is moved alike by physical suffering, mental anguish, or spiritual sorrow. He is quick to recognize and generous to acknowledge the presence of faith or any other grace in his fellow men. He is so just and fair and at the same time so merciful and considerate. He grieves over the spiritual obstinacy of the people and rejoices when they consent to see the light of truth. 161:2.6 5. He seems to know the thoughts of men’s minds and to understand the longings of their hearts. And he is always sympathetic with our troubled spirits. He seems to possess all our human emotions, but they are magnificently glorified. He strongly loves goodness and equally hates sin. He possesses a superhuman consciousness of the presence of Deity. He prays like a man but performs like a God. He seems to foreknow things; he even now dares to speak about his death, some mystic reference to his future glorification. While he is kind, he is also brave and courageous. He never falters in doing his duty. 161:2.7 6. We are constantly impressed by the phenomenon of his superhuman knowledge. Hardly does a day pass but something transpires to disclose that the Master knows what is going on away from his immediate presence. He also seems to know about the thoughts of his associates. He undoubtedly has communion with celestial personalities; he unquestionably lives on a spiritual plane far above the rest of us. Everything seems to be open to his unique understanding. He asks us questions to draw us out, not to gain information. 161:2.8 7. Recently the Master does not hesitate to assert his superhumanity. From the day of our ordination as apostles right on down to recent times, he has never denied that he came from the Father above. He speaks with the authority of a divine teacher. The Master does not hesitate to refute the religious teachings of today and to declare the new gospel with positive authority. He is assertive, positive, and authoritative. Even John the Baptist, when he heard Jesus speak, declared that he was the Son of God. He seems to be so sufficient within himself. He craves not the support of the multitude; he is indifferent to the opinions of men. He is brave and yet so free from pride. 161:2.10 9. In his prayer life he appears to communicate directly with his Father. We have heard few of his prayers, but these few would indicate that he talks with God, as it were, face to face. He seems to know the future as well as the past. He simply could not be all of this and do all of these extraordinary things unless he were something more than human. We know he is human, we are sure of that, but we are almost equally sure that he is also divine. We believe that he is divine. We are convinced that he is the Son of Man and the Son of God. 161:2.11 When Nathaniel and Thomas had concluded their conferences with Rodan, they hurried on toward Jerusalem to join their fellow apostles, arriving on Friday of that week. This had been a great experience in the lives of all three of these believers, and the other apostles learned much from the recounting of these experiences by Nathaniel and Thomas. 161:2.12 Rodan made his way back to Alexandria, where he long taught his philosophy in the school of Meganta. He became a mighty man in the later affairs of the kingdom of heaven; he was a faithful believer to the end of his earth days, yielding up his life in Greece with others when the persecutions were at their height. 161:3.1 Consciousness of divinity was a gradual growth in the mind of Jesus up to the occasion of his baptism. After he became fully self-conscious of his divine nature, prehuman existence, and universe prerogatives, he seems to have possessed the power of variously limiting his human consciousness of his divinity. It appears to us that from his baptism until the crucifixion it was entirely optional with Jesus whether to depend only on the human mind or to utilize the knowledge of both the human and the divine minds. At times he appeared to avail himself of only that information which was resident in the human intellect. On other occasions he appeared to act with such fullness of knowledge and wisdom as could be afforded only by the utilization of the superhuman content of his divine consciousness. 161:3.2 We can understand his unique performances only by accepting the theory that he could, at will, self-limit his divinity consciousness. We are fully cognizant that he frequently withheld from his associates his foreknowledge of events, and that he was aware of the nature of their thinking and planning. We understand that he did not wish his followers to know too fully that he was able to discern their thoughts and to penetrate their plans. He did not desire too far to transcend the concept of the human as it was held in the minds of his apostles and disciples. 161:3.3 We are utterly at a loss to differentiate between his practice of self-limiting his divine consciousness and his technique of concealing his preknowledge and thought discernment from his human associates. We are convinced that he used both of these techniques, but we are not always able, in a given instance, to specify which method he may have employed. We frequently observed him acting with only the human content of consciousness; then would we behold him in conference with the directors of the celestial hosts of the universe and discern the undoubted functioning of the divine mind. And then on almost numberless occasions did we witness the working of this combined personality of man and God as it was activated by the apparent perfect union of the human and the divine minds. This is the limit of our knowledge of such phenomena; we really do not actually know the full truth about this mystery.